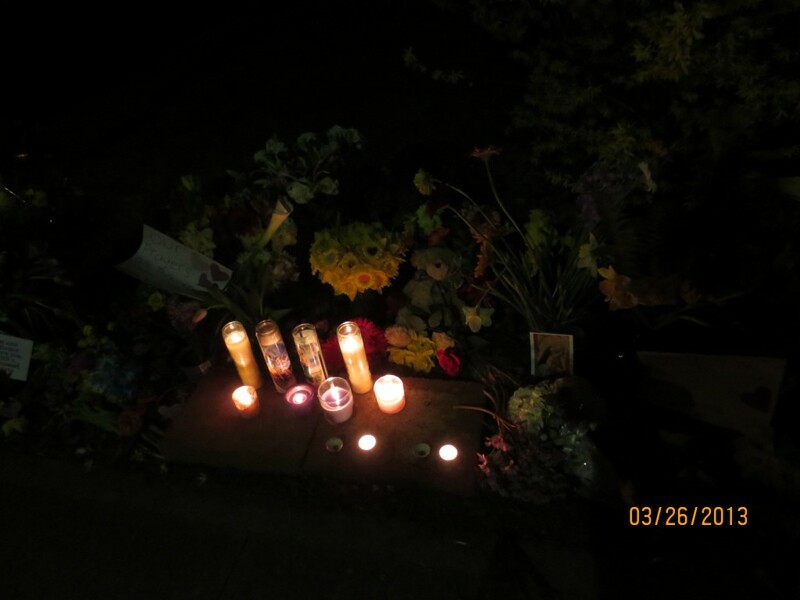 On Monday, March 25, 2013, a family crossing NE 75th Street at 33rd Avenue NE was struck by a drunk driver. Grandparents Judy and Dennis Schulte were killed instantly. New mother Karina Ulriksen-Schulte and her ten-day-old baby boy, Elias, were both critically injured. 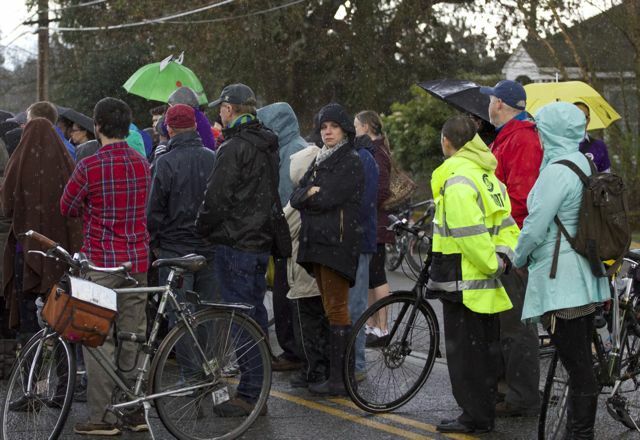 A year later, Karina and Elias, along with other family members, community members, safe streets advocates, and local community and state representatives returned to the site together. 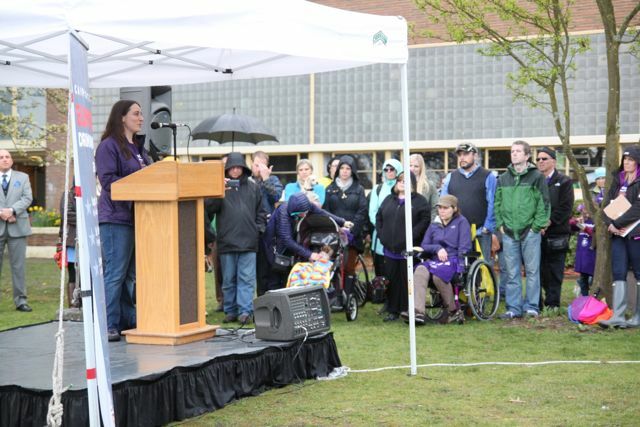 And then continued on to a rally for more action to prevent driving while intoxicated. 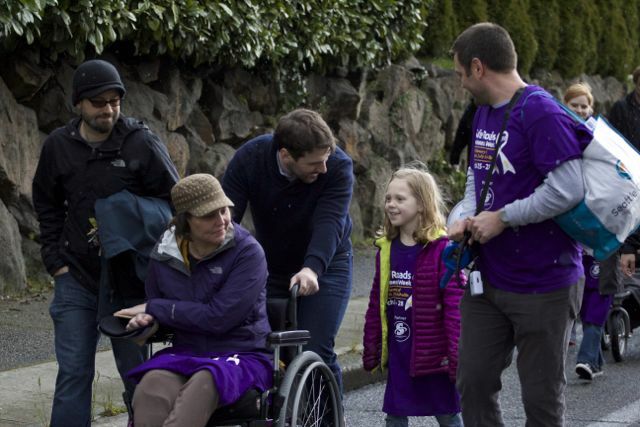 The weather seemed to echo the emotions of the walkers: Blazing bright sunlight one moment — matching the smiles of those on the walk — followed by dark skies, heavy rains, and heavy hearts. 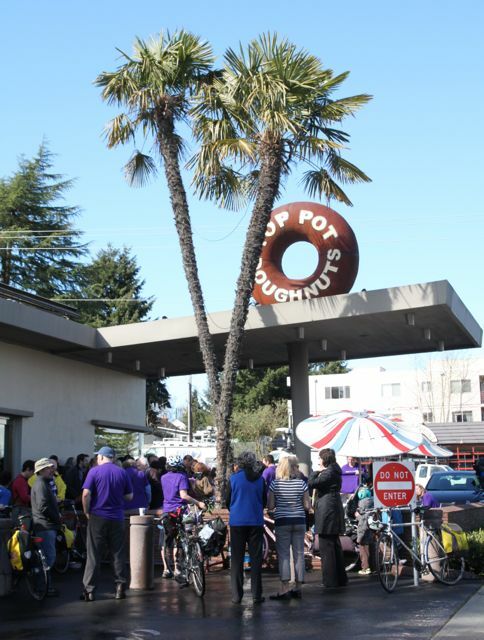 The starting point of the anniversary memorial walk was the same as it was almost a year ago: Top Pot Doughnuts, on the corner of NE 70th St and 35th Ave NE. Before joining the main group of walkers across the street, members of the Schulte family met with some of the staff of Fire Station 40. Their engine was one of the first emergency vehicles to arrive at the collision scene a year ago. Dan Schulte and one of the fire fighters of Station 40. 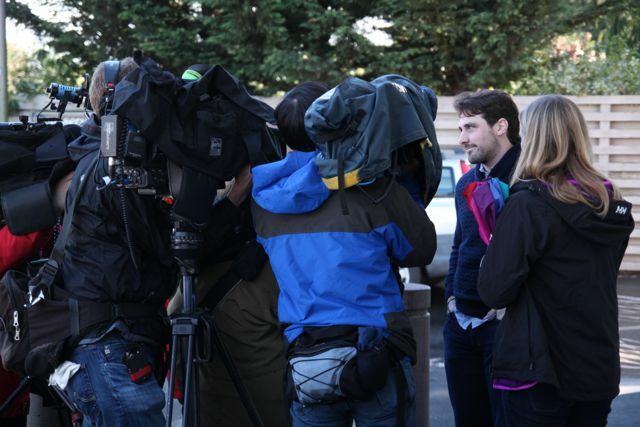 Back over at Top Pot, local media had some time to talk to Dan Schulte before the walk. Here’s the same scene from another angle. 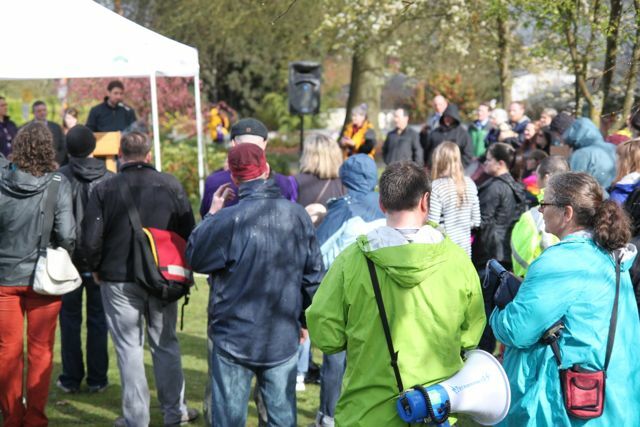 Per Johnson of the Wedgwood Community Council speaks to the gathered walkers. 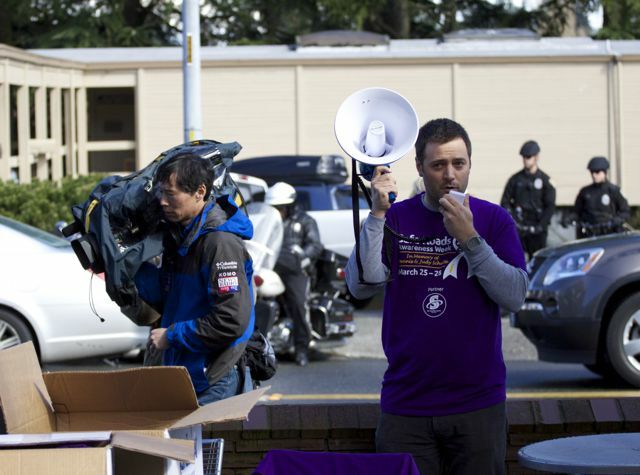 Purple shirts were given to participants to wear during the walk and rally, and also to the other events during Safe Roads Awareness Week. Dan Schulte with his sister, Marilyn. 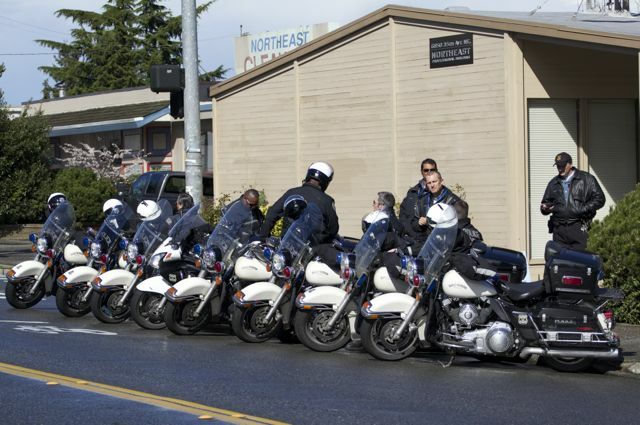 Seattle Police Department officers prepare to guide those on the memorial walk down the route to the crash. 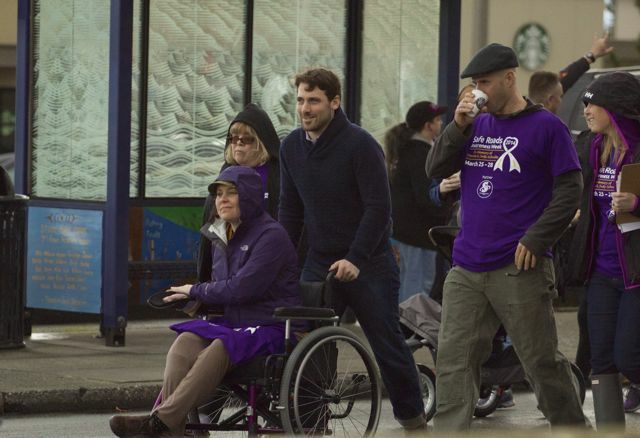 Dan Schulte pushes his wife, Karina Ulriksen-Schulte, at the beginning of the memorial walk. 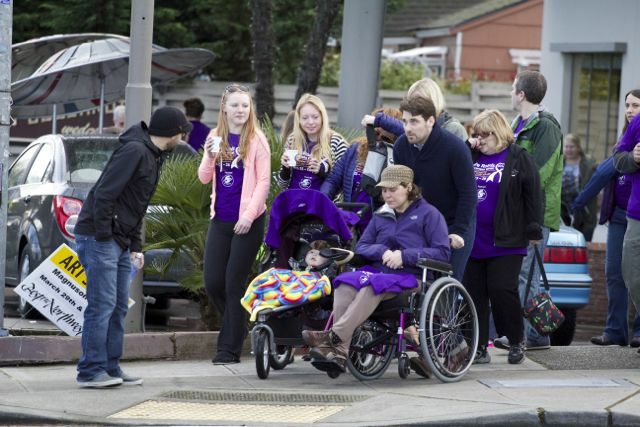 Their son, Elias, is in the stroller on Karina’s right. 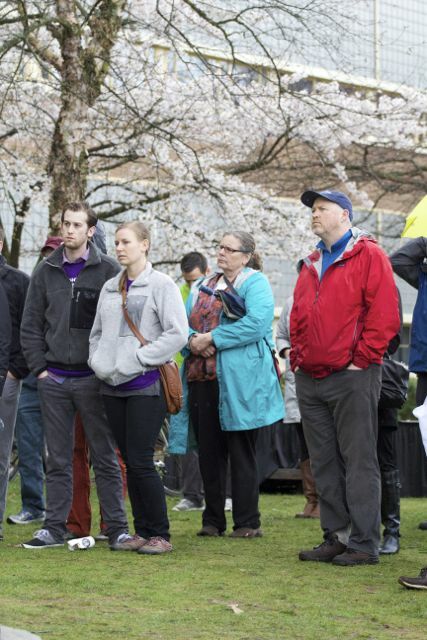 Former Mayor Mike McGinn (center, with blue cap) at the start of the walk. 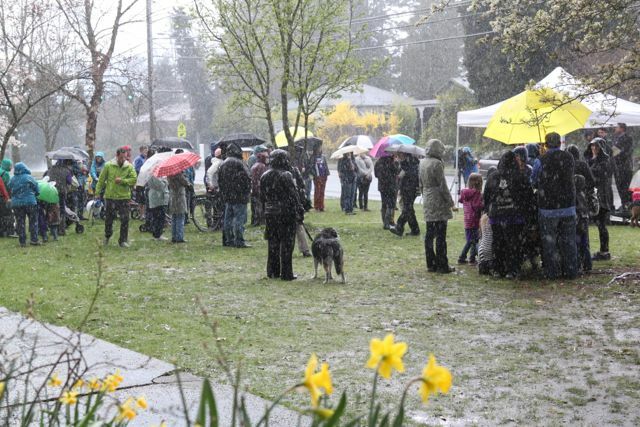 State Representative Gerry Pollet (teal jacket, in front of yellow umbrella). 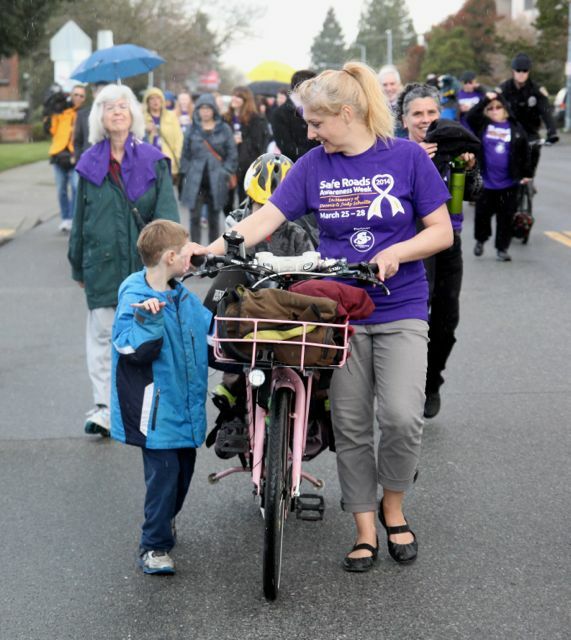 Madi Carlson, Family Ride, walks her wheels and brood down NE 35th Avenue. 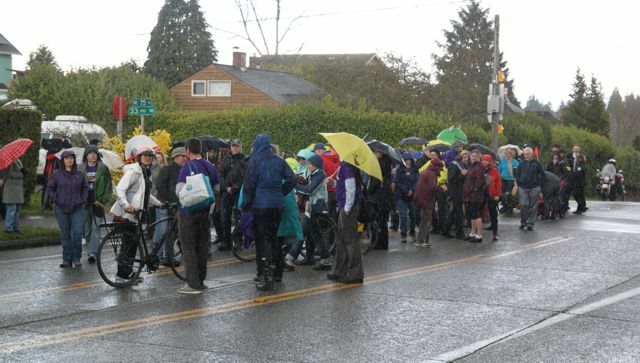 The first round of heavy rain begins as the group nears the intersection of 35th Avenue NE and NE 75th Street. State Representative Jessyn Farrell (tan trenchcoat) walks with her two children. 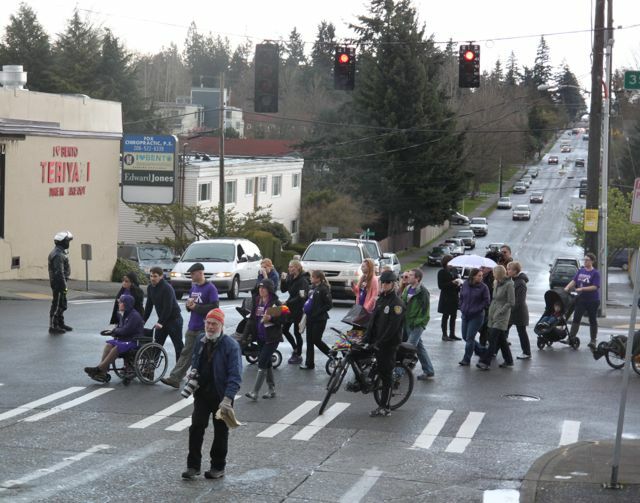 The group begins to cross the intersection of 35th Avenue NE and NE 75th Street. 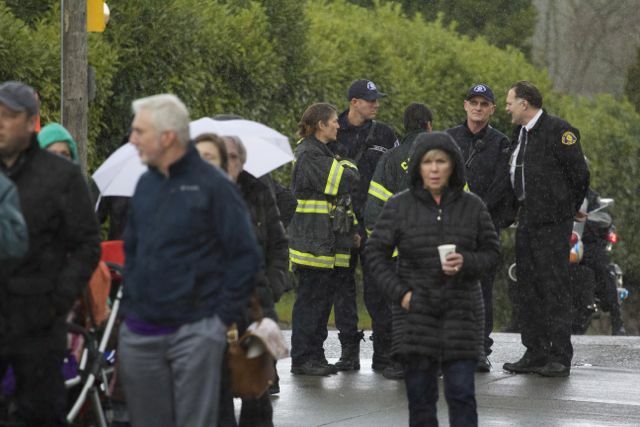 As they walk up the hill towards 33th Avenue NE, the walkers take the same route (west up NE 75th Street) as Mark Mullan did in his large black pick-up truck one year ago. Dan and Karina, and family. Schulte family members moving on after a pause at the crash site. 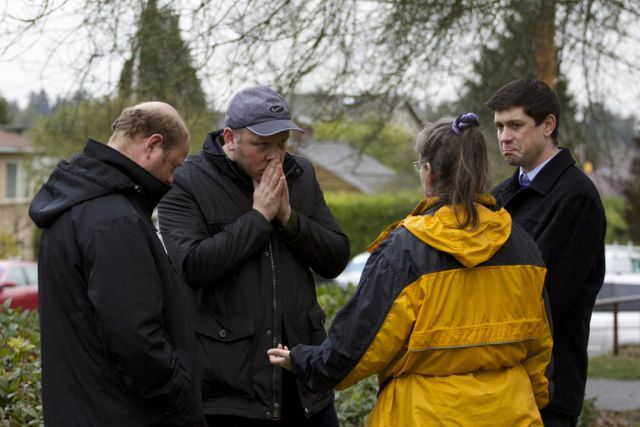 One woman watches the family walk on as the main group of walkers continues to linger for a quiet moment at the site of the crash. Main group now moving toward the site of the rally on the lawn of nearly Eckstein Middle School. Battalion 6 Chief Mike Milam (white shirt, black tie) speaks with Fire Station 40 staff near the crash site. Chief Milam was also at the scene a year ago. 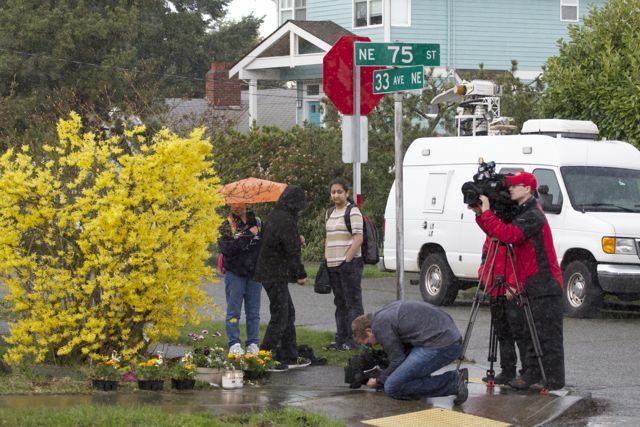 News crews film the crowd and the memorial site while some Eckstein students look on. By the time the group arrives at the rally site, the rain was coming down hard. Ravenna-Bryant Community Association board member Sarah Swanberg. Dan Schulte thanks the first responders in attendance, and the crowd applauds. 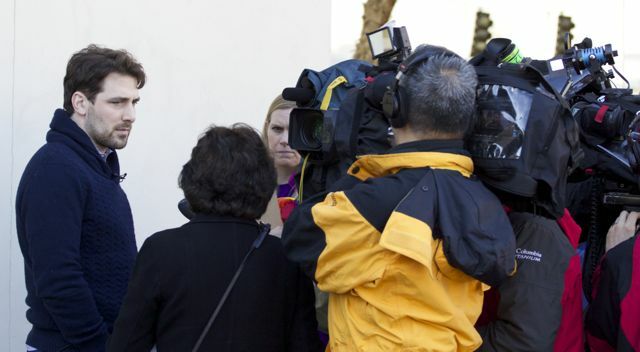 Karina Ulkisen-Schulte (center with brown cap) listens to husband Dan speak. Per Johnson (green), Cathy Tuttle (teal), and the crowd. 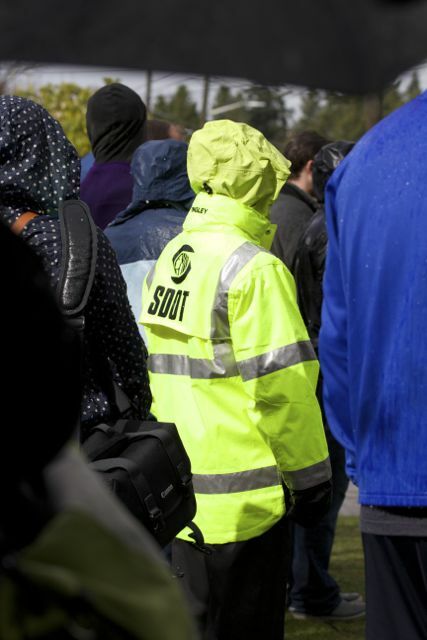 SDOT’s Chief Traffic Engineer, Dongho Chang, was easy to spot in the crowd. 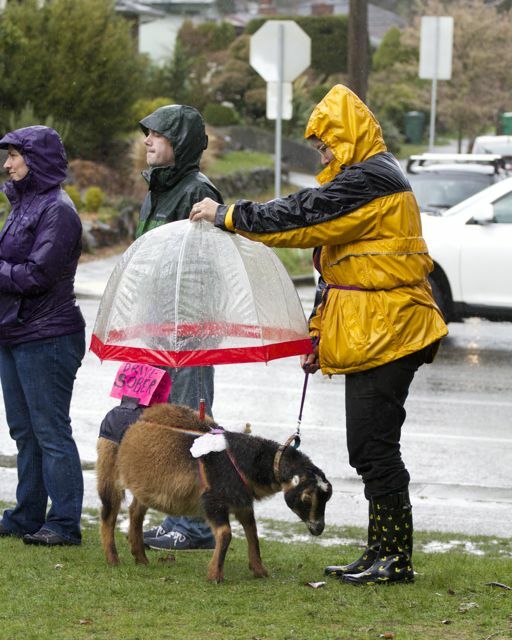 Lacia Lynn Bailey keeps Judy’s Truffle dry at the rally. Lacia and a much smaller Judy’s Truffle were the last to speak with Judy, Dennis, Karina and Elias before they continued down 33rd Avenue NE to cross the street. She would also be one of the first people at the collision scene moments later. 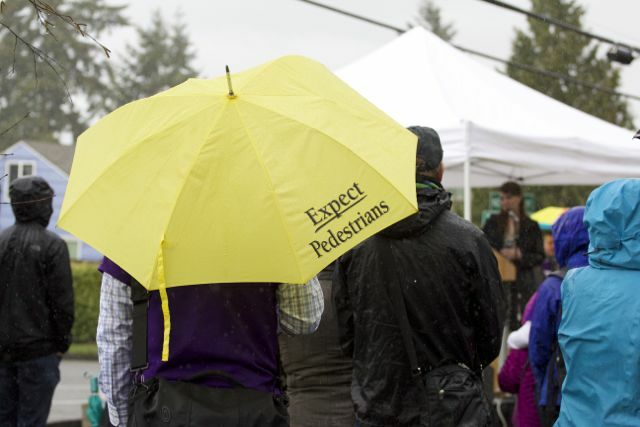 SDOT Traffic Safety Coordinator Jim Curtin stands under his yellow umbrella during downpour number three of the event. 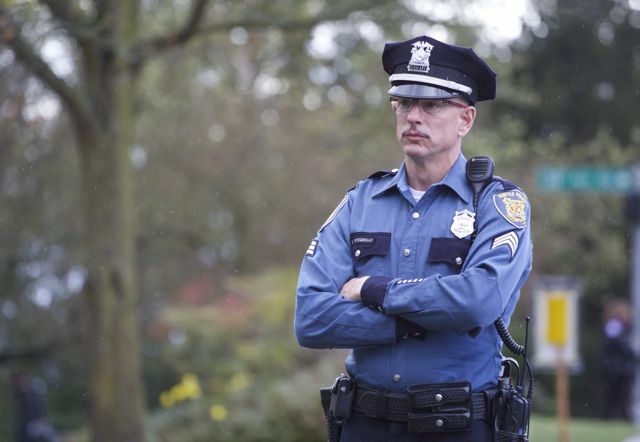 Sergeant Dave Fitzgerald of the Seattle Police Department, listening to speakers at the rally. 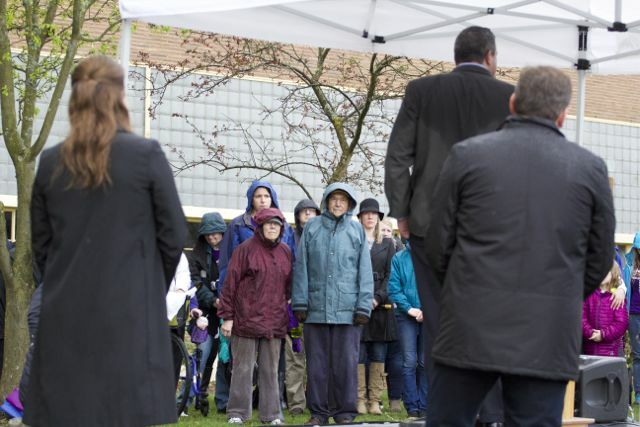 Mayor McGinn (in red) stands next to Cathy Tuttle, executive director of Seattle Neighborhood Greenways. Virginia Gunby (burgundy coat), Transportation Chair of the Ravenna-Bryant Community Association, and her husband listen to rally speaker Darrin Grondel, Director of the Washington Traffic Safety Commission. 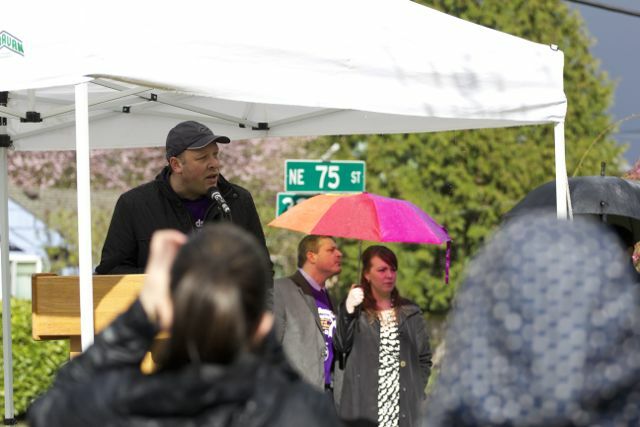 State Senator David Frockt speaking at the rally. 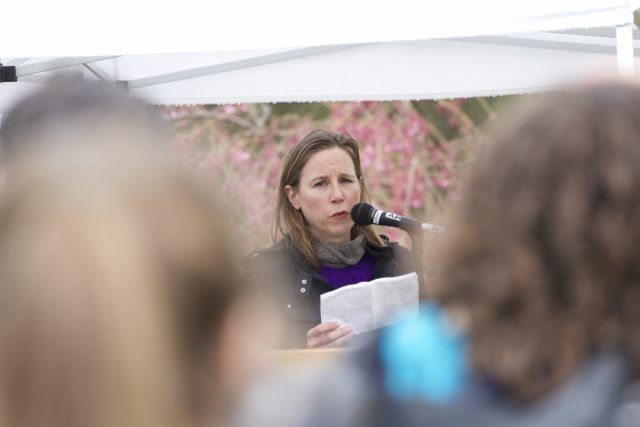 Courtney Popp, an attorney who volunteers with MADD, also spoke. 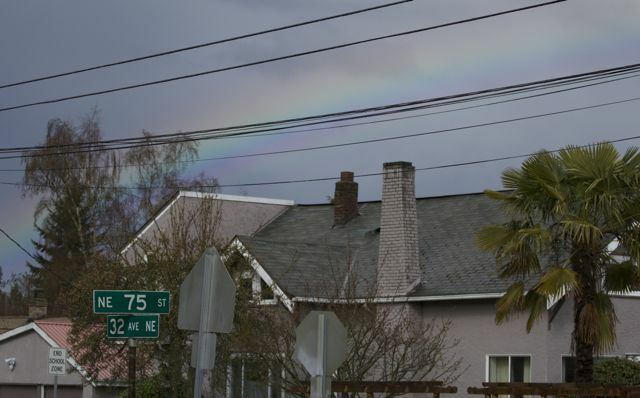 During a shift between pouring rain and pouring sunlight, we did get a rainbow near the crash site. Marilyn Schulte addresses the crowd, thanking neighborhood residents for their support of her family. After the rally concluded, Senator Frockt and a staffer (facing the camera) listened to Lacia Bailey describe the events of a year ago. 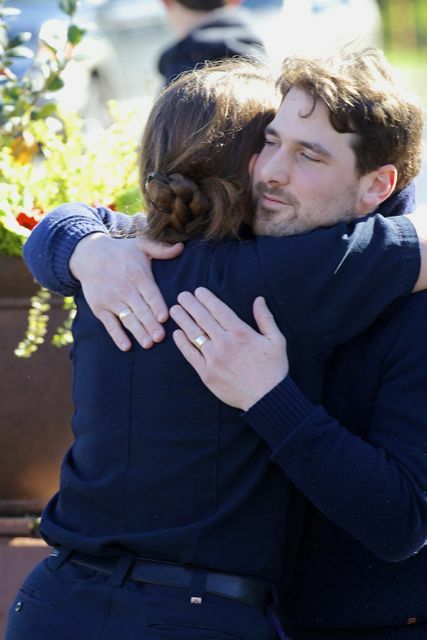 Frockt’s own grandparents were killed in a collision by a suspected intoxicated driver in Tennessee. Natural flowers at the rally site. 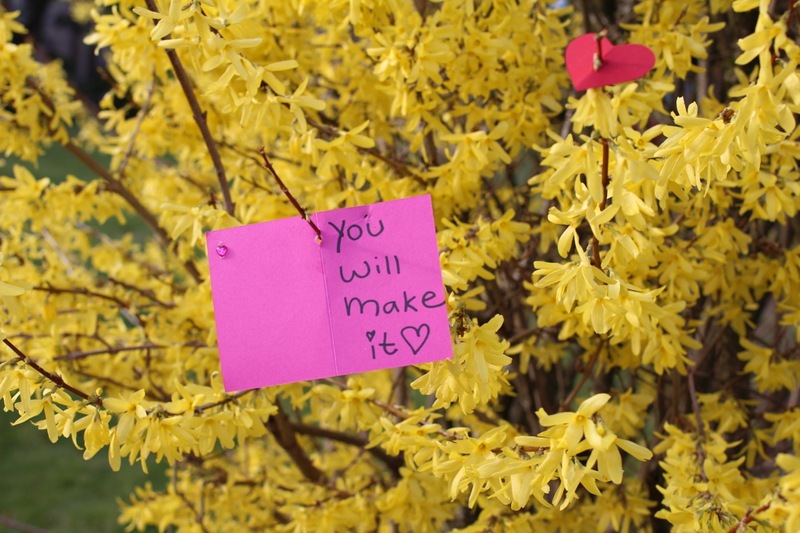 Hand-made flowers on Lacia’s fence across from the crash site. 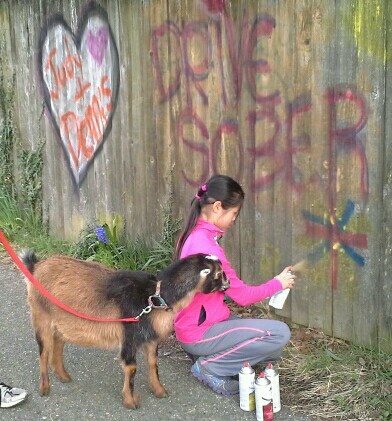 The afternoon before the walk and rally, Lacia invited the community to come paint her fence, just across the street from the crash site, with bright flowers and positive messages to “DRIVE SOBER.” Judy’s Truffle was on hand, offering suggestions and reprising her position last year of comfort goat to those who needed a nuzzle. 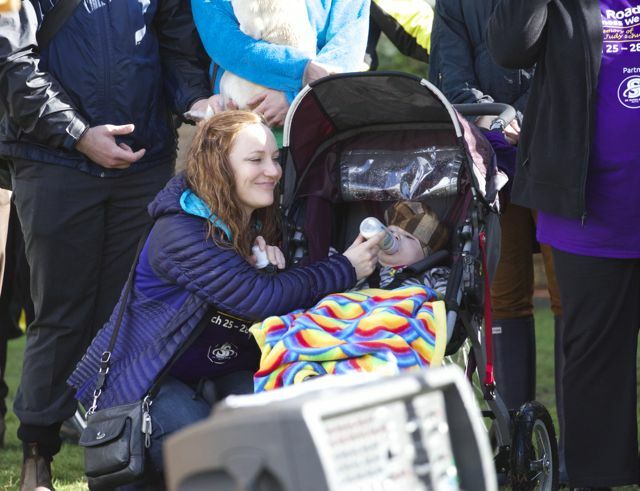 Tuesday, March 25, marks one year since the drunk driving crash that killed Judy and Dennis Schulte and severely injured Karina Ulriksen-Schulte and her newborn baby boy, Elias. 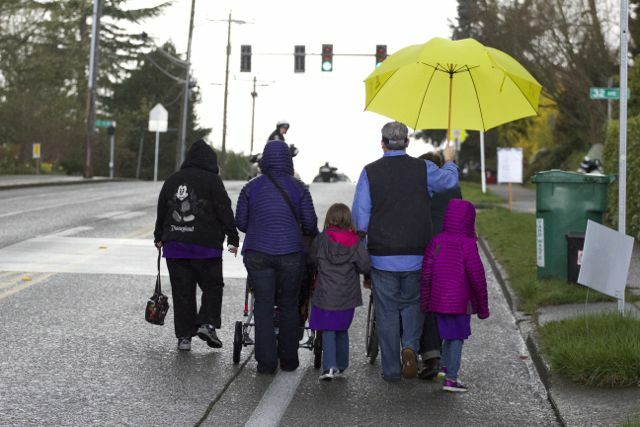 To commemorate the day, the Wedgwood Community Council and the Ravenna-Bryant Community Association have organized a memorial walk and rally, starting at Top Pot Doughnuts (6855 35th Ave NE), and ending on the front lawn of Eckstein Middle School (3003 NE 75th St). A moment of silence will be held at the crash site at approximately 4 PM. 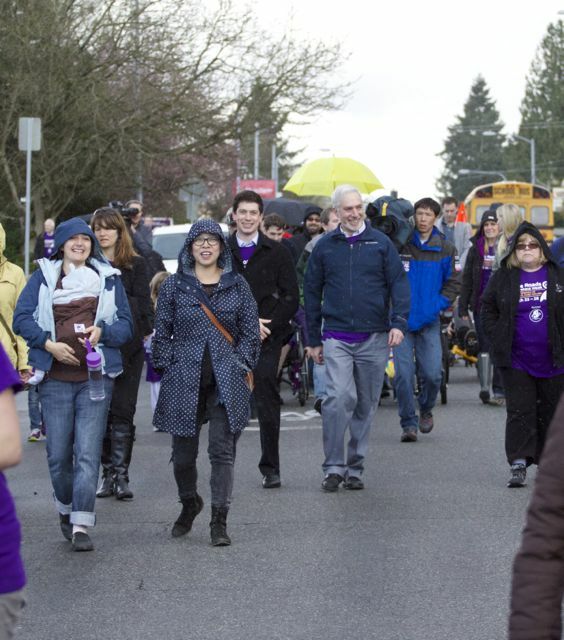 NE 75th Street will close to traffic from 31st Ave NE to 35th Ave NE during the walk (3:15-4:15 PM). This event on March 25 is the first in a week-long series of events promoting “Safe Roads Awareness Week,” and focuses on raising awareness of the need for DUI prevention and stricter DUI laws. The Wedgwood Community Council (WCC) and volunteers will be holding signs during the morning/evening commute to remind folks that the phone call or text can wait. Again, the WCC and volunteers will be holding signs at a busy intersection during morning/evening commutes. Again, the WCC and volunteers will be holding signs at a busy intersection during morning/evening commutes. SDOT will make a major traffic safety project announcement. That would mean that the middle school and elementary attendance areas in the NE would go back to October 16th revision with some minor changes basis on community input. At this time, we have heard that only two Directors are openly in support of the amendment: Martin-Morris and DeBell. In order for the amendment to pass, it needs support from four of the seven members of the board. 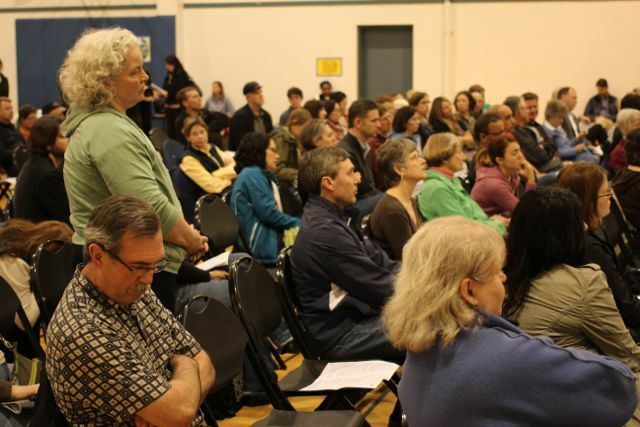 On Monday at a Call to Action meeting at Wedgwood Elementary that over 200 parents attended, many voiced surprise over the revisions made to the previous Growth Boundary maps (released on October 16), as well as bewilderment over why the November revisions were made in the first place. And no explanation for the changes — released last Friday at 7 PM ahead of a Wednesday meeting — were given by the School Board. On behalf of the Ravenna Bryant Community Association Board of Directors, I ask that the school boundaries proposed on Friday November 1st not be adopted because they do not meet three of the four core values for Seattle’s Comprehensive Plan. 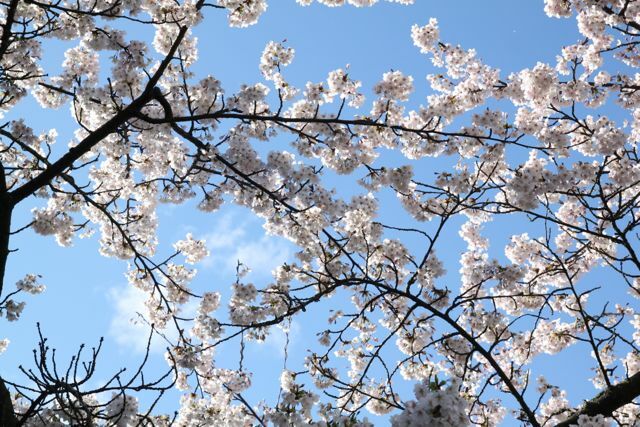 Our neighborhood schools create a strong sense of Community because families can walk to school, for the school day as well as extracurricular activities. The new boundary proposal would erode this sense of community by forcing kids to attend a school miles away, instead of blocks. 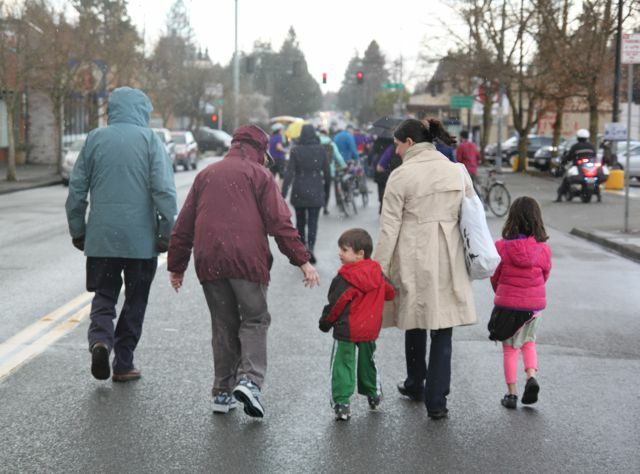 Our neighborhood schools allow families to walk, bike, or carpool to school which not only creates community but also helps meet the City’s Environmental Stewardship goals. Eckstein has a successful walk and bike to school program that would be destroyed by these new boundaries. The last minute release of the proposed boundaries, given at the late hour of 7 p.m. on a Friday night for a Wednesday meeting, does not adhere to the City’s Core Value of Social Equity. Our community is left scrambling at the last minute to provide alternatives and organize ourselves. 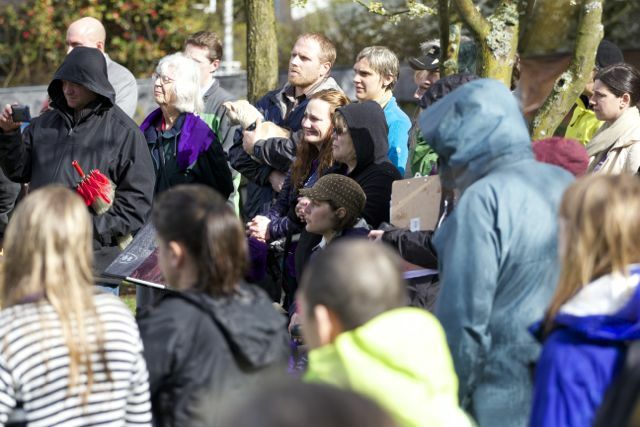 The Ravenna Bryant Community Association urges the School Board to reject these new boundaries, and demands that the Seattle School District create new boundaries that honor the core principals put forth in the City of Seattle’s Comprehensive Plan. Please consider moving the boundaries for Eckstein further north, at least to NE 95th, and find room for the APP at Hamilton in the south wing of Lincoln High School. Tonight’s regular meeting of the Seattle School Board starts at 4:15 PM at the John Stanford Center for Educational Excellence (2445 3rd Avenue S). The agenda for tonight’s meeting is available here (PDF). Public testimony is scheduled to start at 5 PM for those 25 speakers who were pre-selected; an additional 63 on the wait list), with the Action Items and Introduction Items portion scheduled to start at 6 PM. School Board meetings are streamed live online (though not for iOS users, it seems) and broadcast on Channel 26 (Seattle Public School TV). We will have live coverage of tonight’s meeting below, if we can. We’ll be watching along at home, and taking notes. UPDATE (2:29 PM): It is our understanding from a Keep Wedgwood Neighborhood Kids at Eckstein Facebook page post by Wedgwood Elementary School PTA President Terri Green that the newest version of the Growth Boundaries map AND Director Harium Martin-Morris’ amendment will BOTH be introduced at the meeting tonight, and voting will take place on both at the next School Board meeting on November 20. 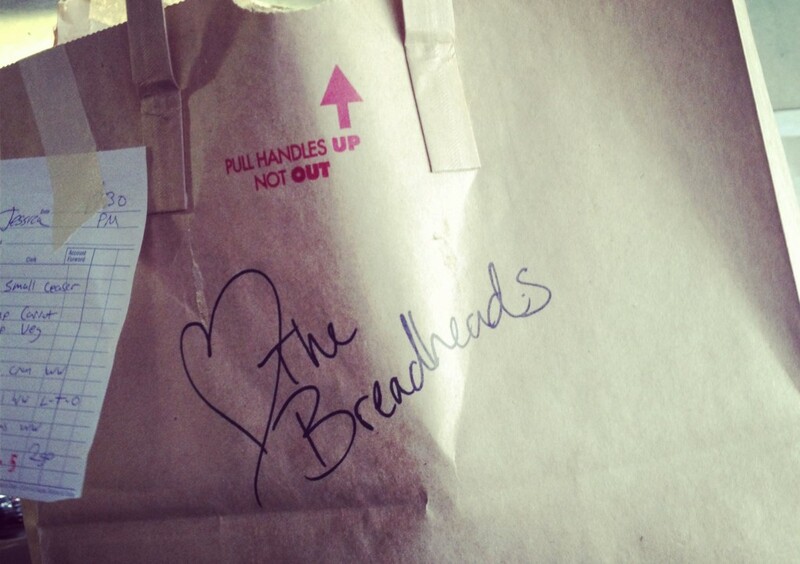 In case there was confusion on the order of things. As with many of my neighbors, I was also shocked by this last minute change to the assignment plan proposals, which had never been presented at a public meeting. The proposal would dramatically undermine much of the benefits achieved by the District in adopting a neighborhood assignment plan. It is unacceptable that students immediately north of 75th – within sight of Eckstein – would be assigned to Addams. When I heard from neighbors about this change to the Plan, I reviewed the materials prepared for the Board’s meeting and was dismayed that they do not disclose this impact in plain language. 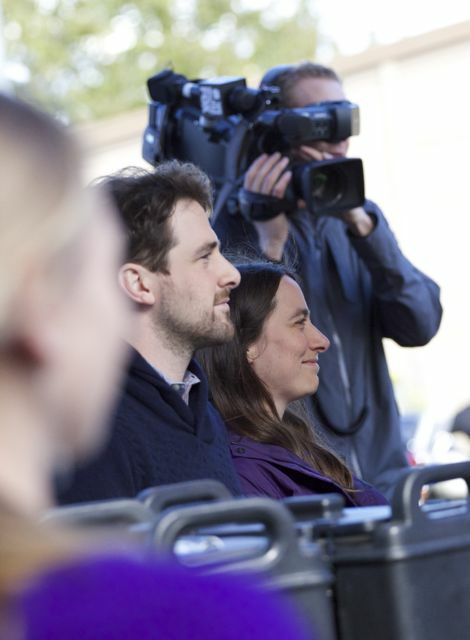 One has to first review the detailed map and wade through the bureaucratic lingo to piece together that this dramatic change to our community would be put in place in September. 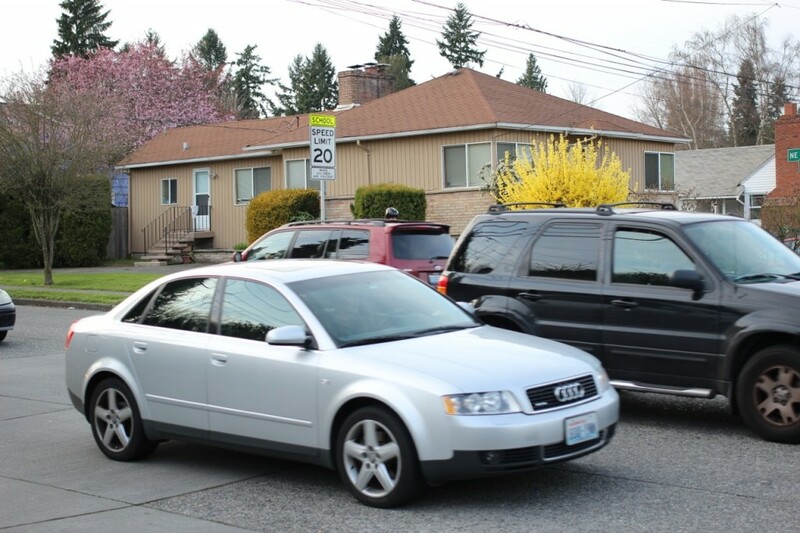 Students in the Wedgwood Elementary assignment zone between NE 75th (where Eckstein is) and NE 95th, would be walking to school where there are no sidewalks and a very dangerous arterial on a steep hill to cross. Ironically, our community has been working with the City to improve the crosswalks, signals and speed on NE 75thto allow students to safely cross to and from Eckstein. We can reduce transportation costs and increase safety by amending this plan to resume having Wedgwood Elementary feed Eckstein. I am all too well aware of the incredible overcapacity problem at Eckstein, coupled with ancient portables and other capacity issues. This latest proposal is not a solution for that problem. 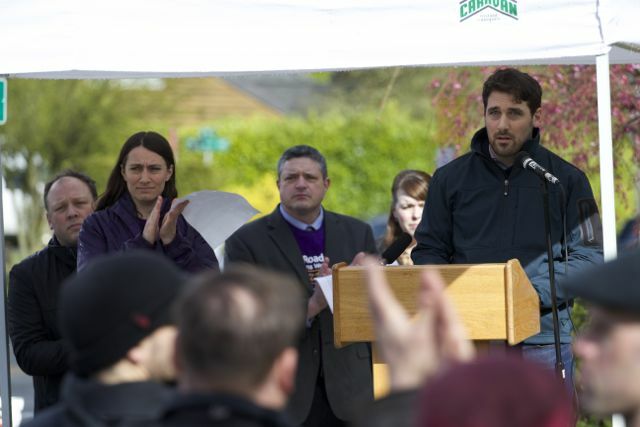 As you know, along with my colleagues, I have worked to bring significant funding and resources to reopen and renovate schools to address the overcrowding across NE and N Seattle. We will continue to work with the District to procure funds – and hope that the District will work with the City and your legislative delegation to obtain new properties near the core of our overcrowding problems, e.g., Roosevelt Reservoir and Lake City Pierre properties. The community south of NE 50th Street had to petition and organize to be kept together with their neighborhood assignment to Bryant Elementary in the last set of decisions. 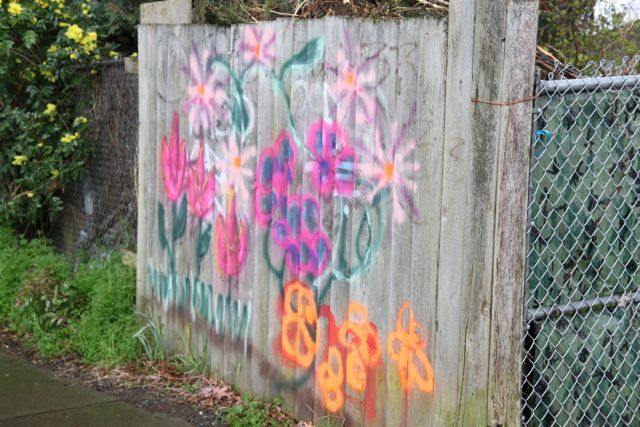 It is disheartening that this effort and commitment to that community would be ignored again in the latest boundary change proposal – again without having provided the community a chance to comment at the meetings. The repeated need to organize communities to have the same discussion about integrity of neighborhoods and stability in assignments undermines the excellent progress made by the District in the School Assignment Plan. Primary ballots start appearing in mailboxes soon — Do you know who your Seattle mayor candidate-of-choice is? If not, you can catch most of them at a Mayoral Candidates Forum put on by the Northeast District Council on Wednesday, July 17. Meet and greet the candidates at 6:30 PM, with a forum from 7-9 PM. The event is being held at the Seattle Musical Theatre in Magnuson Park. 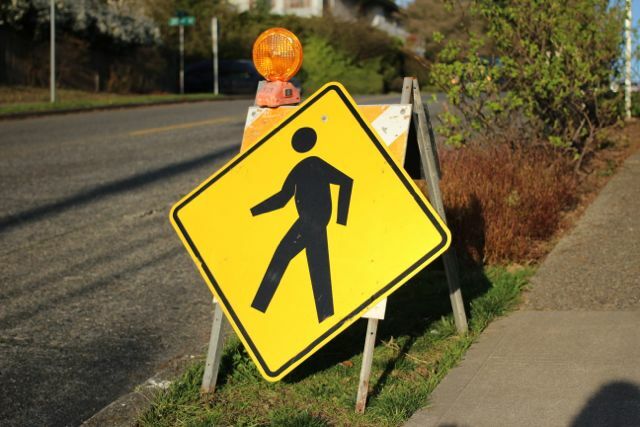 You are warned, however, that there is a paving project happening along Sand Point Way NE and NE 125th St. If you’re coming from the north, head south on 35th Ave NE, then east on NE 70th St. If you’re coming from the south, you’re likely to encounter slow traffic on Sand Point Way NE. 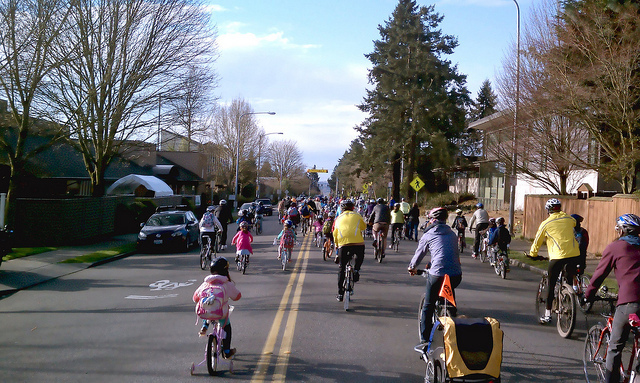 If you’re walking to the event, or riding a bike, watch out for cars using neighborhood streets as detours. 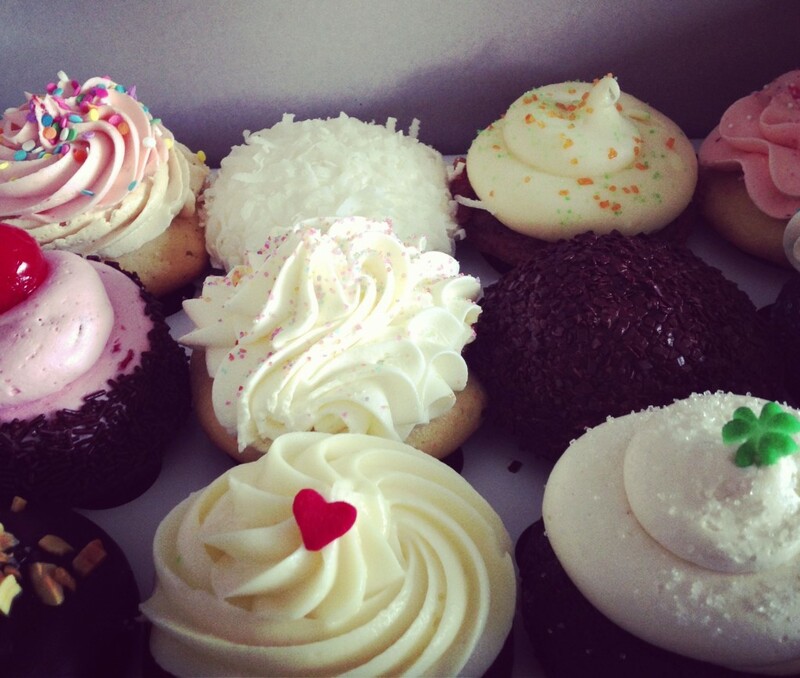 35th Avenue NE business district survey ends this Sunday — take it now! Members of the Wedgwood Community Council and Ravenna-Bryant Community Association, together with other neighbors and local business owners have combined to form a group working on a neighborhood plan for 35th Avenue NE. And part of that plan involves asking users of 35th Avenue NE what they think of the place, so the group has put together a survey. 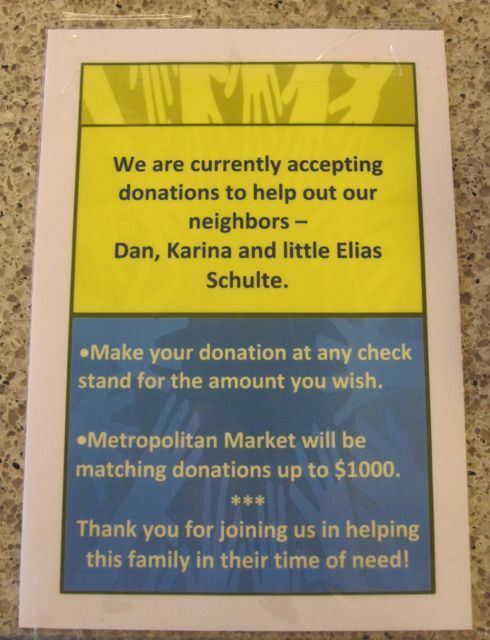 If you find yourself on 35th Avenue NE on a regular (or even irregular basis), no matter where you live, your input is requested, and appreciated. The survey has 31 questions, and takes 5-10 minutes to complete. Learn more about the 35th Avenue NE neighborhood planning group/process here. 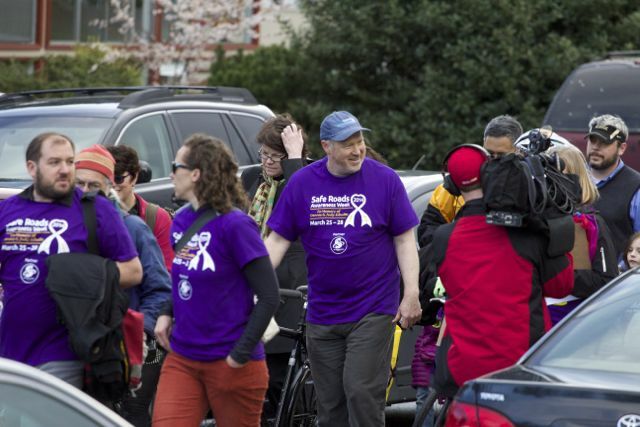 In the early afternoon of Monday, April 1, before the Memorial Walk for the Schulte family, neighborhood groups, pedestrian/bicycle safety advocates, and staff from Eckstein Middle School, gathered at Eckstein (3003 NE 75th St). 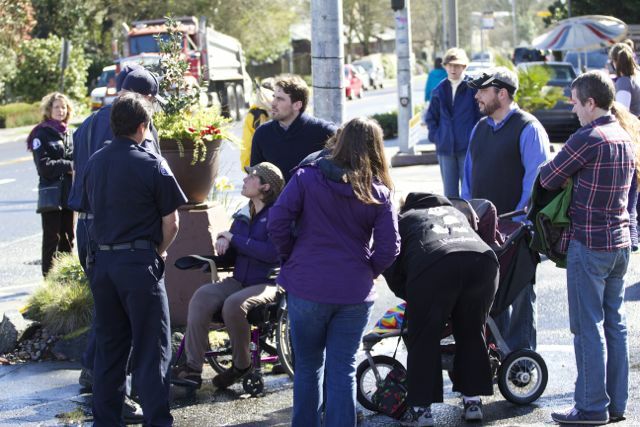 They met with representatives from the Seattle Department of Transportation (SDOT), the Mayor’s Office, and the Seattle Police Department and discussed plans to improve the safety of NE 75th Street. The timeline for these improvements shows a tentative completion date of August 2013 (just before Seattle Public Schools are back in session for the 2013-1014 school year). 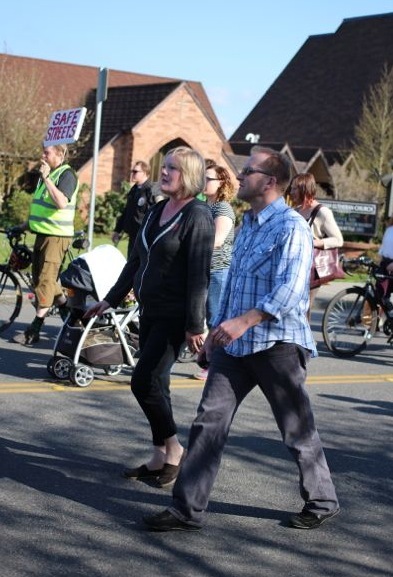 Read more about the planned street safety improvements on the Mayor’s blog, here.